Ewaso Lions helps local communities find ways to coexist with wildlife. This is crucial, because one of the greatest threats to lions is humans killing them. As some of Samburu's lions live outside formally protected areas, they often come into contact with the Samburu livestock. In retaliation for cattle killed by lions, the Samburu sometimes hunt the lions. 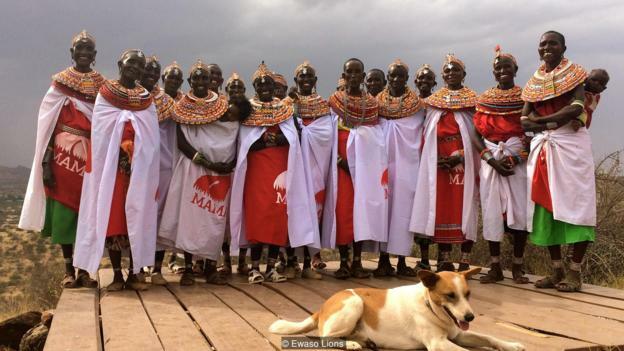 The Mama Simba project began when local women went to Ewaso Lions asking to be educated. Mama Simba means "the Mother of Lions" in Maa, the local language. "The women had seen how warriors in their community were being engaged in conservation through another of Ewaso Lions's projects," says Heather Gurd, conservation manager at Ewaso Lions. "They were adamant that they could do just as good a job as the warriors if only they were given the chance." Samburu women actually spend a great deal of time in wildlife areas whilst they collect firewood, fetch water and look after livestock. This means they often come into contact with animals like lions. Yet before this project, the women were rarely actively included in conservation activities. Ewaso Lions is educating the Samburu women in basic literacy, numeracy, and wildlife conservation. They also train them in beaded art craft, so that they can diversify their income and not depend solely on livestock. Since Mama Simba was launched in 2013, over 300 Samburu women have participated in the programme. There is a core group of 19 who spread the word. "Empowerment means that women are given a chance to lead, like men do," says Ntomuson Lelengeju, a Mama Simba participant. "Women and men are now getting equal opportunities in terms of resource sharing," says Noldonyo Letabare, who also takes part. As well as benefiting the women, the project should also help the lions. To achieve this, the women are trained in how to better protect their livestock enclosures from predators. They also learn how to identify carnivore tracks, and tell Ewaso Lions about lion sightings and any conflicts that arise. It is too soon to tell whether this new project has benefited the lion population. But there is evidence that people's attitudes towards lions are becoming more positive. "I have changed as a result of the Mama Simba programme," says Lelengeju. "I now cannot accept people to kill lions." "Since joining the programme I have learned to love lions, unlike before," says Letabare. "We have seen a real change in the confidence and enthusiasm that the ladies have," says Shivani Bhalla, executive director of Ewaso Lions. "They were once very quiet and shy, never speaking up at any community meetings or talking about wildlife. Now they are vocal about conservation." Join over five million BBC Earth fans by liking us on Facebook, or follow us on Twitter and Instagram. If you liked this story, sign up for the weekly bbc.com features newsletter called "If You Only Read 6 Things This Week". A handpicked selection of stories from BBC Future, Earth, Culture, Capital, Travel and Autos, delivered to your inbox every Friday. At Jukani our mission is to maintain and manage a sustainable wildlife sanctuary, with the focus on creating widespread awareness about the plight of large predators in captivity, in South Africa and all over the world. © Copyright 2016 Jukani Wildlife Sanctuary. All rights reserved. Hosting by Gardenroute.com Site development by HandMade Connections.